She doesn’t know Zach Cadwalder or have any affiliation with his family, but when Jessica Kane heard about the fundraiser that will benefit the sick 5-year-old, she knew she wanted to be a part of it. “I’m a teacher, and it’s terrible to see a child sick. So, anything you can do,” she said. Ms. Kane was one of hundreds who came out to support the Cadwalders after the Green Ridge family found out in November that Zach had diffuse intrinsic pontine glioma – an inoperable brain tumor. The family takes Zach to an experimental clinical trial at the National Institutes of Health in Maryland for treatment. Family and friends pulled together to make sure the family had what they needed to get by. 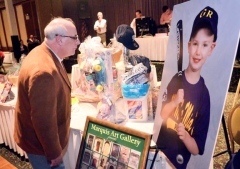 With a large picture of Zach dressed in a purple baseball uniform – his ears poking out from his cap, clutching a bat and flashing a toothy grin – displayed in the middle of St. Mary’s Center on Friday night, hundreds of people came to eat, drink and buy raffle tickets. The proceeds go toward the young boy’s medical care and travel expenses as Zach undergoes radiation and chemotherapy five days a week. His family said his attitude is as positive as ever. “He’s very brave. He’s happy and outgoing,” Ms. Kasaczun said of her little cousin. Zach’s aunt, Lauren Washo, said the family can only be grateful for the overwhelming support shown for the 5-year-old. “He’s our superhero,” Ms. Washo said. Ms. Kane said working with children as a pre-kindergarten teacher has shown her a lot about the spirit of young kids like Zach.